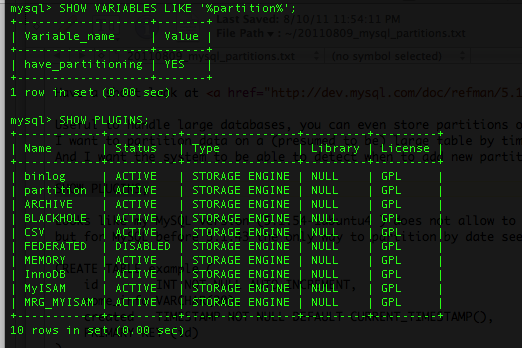 Have a short look at mysql partitioning. Useful to handle large databases, you can even store partitions on different devices. I want to partition data on a (presumed to be) large table by timestamp, more precise I want a partition for each month. And I want the system to be able to detect when to add new partitions on its own (upcoming blogpost for this). Note: if you want to insert data into a partitioned table where you don’t have a partition fitting for this data, you get an error. That’s why you should always have a last partition with ‘VALUES LESS THAN MAXVALUE’ and no gaps in between. Good to know: you cannot have a primary key for id if you use partitions.